JP Morgan technical strategists hold a short position on EUR/USD since mid-March with a stop at $1.3950, an initial target at $1.3130, and a secondary target at $1.2900. In a short term analysts see a chance to test the $1.3820 resistance area (61.8% Fibo from the 2011-2012 decline). Clear break above here would weaken the bearish view. Decline below $1.3610 would fully confirm the bearish dominance over the pair. Asian shares rose on Wednesday after Wall Street reversed a 3-day losing streak, but Japanese stocks dropped sharply after yen surged on fading hopes of near-term stimulus from the Bank of Japan. MSCI’s broadest index of Asia-Pacific shares outside Japan advanced 0.9%. Nikkei fell by 1.9%. USD/JPY edged up to 102.00 after it tested 100.54 yesterday. Commodity currencies extend the upside on Wednesday. AUD/USD touched $0.9390 in Asia (the highest level since Nov. 2013). Westpac consumer sentiment moved higher for the first time in 5 months (+0.3% in April vs. -0.7% in March). Meanwhile, home loans data confirmed a continued housing rebound. Note that Australia will release a bunch of employment data tomorrow – forecasts are pretty negative. NZD/USD tested the levels above the $0.8700 mark (highest since August 2011). Gold rose to $1314, but holds slightly below the yesterday’s peak. EUR/USD is trading in the $1.3790 area after it rose as high as to $1.3811 yesterday. GBP/USD is trading in the $1.6750 area after it gained more than 130 pips yesterday. USD/JPY remains in a smooth upwards channel. Yesterday the pair slid to its lower border in the 101.50 area as the Bank of the Japan left policy unchanged. Judging from the regulator’s rhetoric, its policy will remain unchanged for a while. This is increasing pressure on USD/JPY to sink lower, to the 200-day MA and February low at 100.75. The pair still hasn’t reached the lower daily Bollinger band. Daily MACD’s approaching 0. Today there was a bullish hammer at H4 and the greenback recovered to the bottom of the daily Cloud in the 102 area. Even if the channel stays, we may see more action in the 102.50 (200-period MA)/101.50 area. As dollar is still at the oversold levels at this timeframe we will sell on the increase towards 102.50 targeting once again the channel’s bottom. The Australian dollar pushed to its highest level in 5 months on Wednesday on a fresh block of strong economic data. AUD/USD extended the bullish recovery, posting highs near $0.9390 in Asian trade. The number of Australia home loan approvals rose at a highest rate since September in February (+2.3%). Record low interest rates continue supporting mortgage lending in the country. What’s more, the Australian April consumer confidence rose slightly, though remains below the key 100-point level. Aussie’s upside remains contained by the $0.9400 mark ahead of the important employment data release on Thursday. Unemployment rate is forecasted to increase by 0.1% to 6.1% in March, while the economy is expected to add only 7.3K new jobs (February: + 47.3K). JP Morgan economists expect only a 5K employment increase for the past month. Technically, the pair is moving in line with an inverse head-and-shoulders formation (neckline at $0.9080). Aussie has recently broken above the 55-week MA and 61.8% Fibo from the Oct.-Jan. downtrend. Our medium target lies at $0.9500 (78.6% Fibo, bottom of the weekly bearish Ichimoku). Note that the pair is overbought; there is a MACD divergence on the H4 chart. Tomorrow’s labor market data will be a good reason for the pair to correct lower. Strong support lies around $0.9200/20. USD/CAD slid to 1.0912 yesterday approaching the 100-day MA and the bottom of the daily Ichimoku Cloud at 1.0900. Canadian dollar gained on Tuesday as the Bank of Japan maintained monetary stimulus and the loss of separatist party at the Quebec election. CAD strengthened since Friday when Canadian employment posted the biggest jump in 7 months, while the unemployment rate in Canada fell from 7 to 6.9%. Yesterday, however, Canada released a bunch of weaker-than-expected housing data. USD/CAD recovered today to 1.0942. There’s bullish divergence at H4 MACD. Analysts at SEB Bank say that to ease the bearish pressure USD/CAD needs to move above 1.0957 and 1.1002, but also over 1.1078/95 is prerequisite to make believe that the correction lower intraday has passed its lowest point. US dollar hit a 5-month low versus a basket of currencies after the Fed’s last meeting minutes undercut prospects for an increase in interest rates. EUR/USD slid to $1.3845 after reaching $1.3870 earlier today. GBP/USD returned to the opening level at $1.3890 after reaching $1.6820 earlier today. USD/JPY is consolidating in the 102.15/101.60 area. Today the greenback fell versus yen. Demand for yen as a safe haven increased after China reported an unexpected drop in imports and exports by 11.3% and 6.6% respectively from the previous year. Commodity currencies faced sellers in Asia. AUD/USD first rose to $0.9440 on better-than-expected labor market data. Unemployment rate fell to 5.8% (forecast: 6.1%), while the economy added 18K jobs (forecast: 7.3K, prior: 48.2K). However, news from China increased market concerns, pulling the Aussie down into the $0.9415 area. NZD/USD followed the AUD, first hitting $0.8745 and then retracing to $0.8715. NZ manufacturing expanded last month to the highest level since July (58.4 vs. prior 56.5). Gold extended the upside to $1317. The US dollar fell against most major currencies on Wednesday after the FOMC minutes from the March 19 meeting showed no signs of higher interest rates ahead. As a result, the USD index weakened to the pre-meeting levels. After the meeting last month, Fed Chairwoman Janet Yellen said the central bank would consider raising interest rates 6-month after the end of QE. However, not all the Fed’s members share her optimistic views. Minutes showed Committee members discussed keeping interest rates low for a longer period of time even after employment and inflation reaches targeted levels. Fed’s inflation target lies at 2%, in February 2014 it came at 1.1%. Deutsche Bank: "With the mention of inflation risks and no confirmation of the 6-month story from Yellen's comments, this tends to lean on the dovish side. And the dovish side is slightly negative for the dollar. Still, the Fed minutes' impact on the dollar is likely to be limited, because the US currency has already weakened considerably since Friday's jobs report. As expected, the Bank of England has left policy unchanged with the benchmark rate at 0.5% and the size of the asset purchase program at 375B. There is no statement in today’s meeting, prompting investors to follow the more ample risk-on trends ahead of the US data later today. GBP/USD is trading in the $1.6795/70 area. 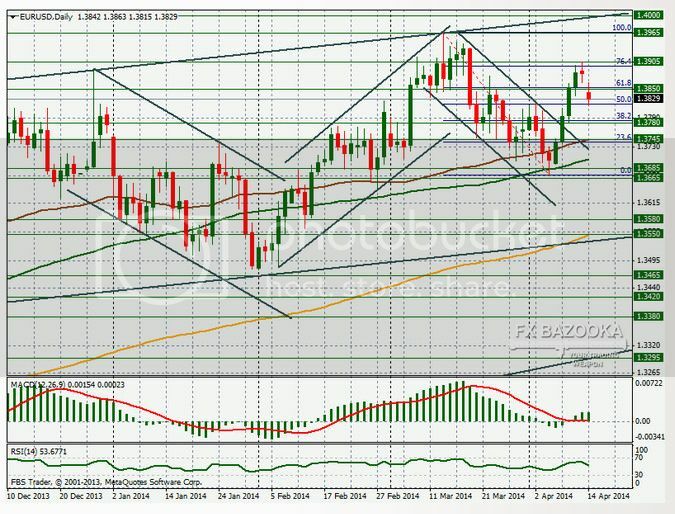 EUR/USD: buy – 1.3820; stop — 1.3790; target1 — 1.3875; target2 — 1.3900. USD/JPY: buy – 101.40; stop — 101.20; target1 — 102.10; target2 — 102.45. EUR/USD made a significant 40-pip gap and declined from the levels in the $1.3900 area to $1.3815. The ECB officials have tried to weaken the single currency: Mario Draghi said that further appreciation of euro would trigger more monetary stimulus. This probably means that the policymakers are uncomfortable with higher euro. At the same time US dollar strengthened as the situation in Ukraine has escalated and investors didn’t really price that in. Analysts at RBC, however, warn that being short EUR is a “very short-term play”, because the conditions in the euro area’s periphery are improving and there’s modest recovery in the euro area’s economy. Danske Bank agrees that ECB’s talk without action won’t lead to the persistent depreciation of euro, because it’s supported by the monetary inflow to the euro area. The crisis in Ukraine will only intensify capital flight to the euro zone. TD Securities say that downside potential for EUR/USD is limited unless we get a clear break below $1.3695. On the US dollar’s pair we have many important data releases this week starting with retail sales on Monday (12:30 GMT). In addition, the Fed’s Chairwoman Yellen will speak on Tuesday and Wednesday. The FOMC meeting minutes last week was more dovish than expected which shows the members of the Fed are still rather uncertain whether American economic recovery has gathered enough pace for a harder monetary policy. Support for EUR/USD lies at $1.3820, $1.3780 and $1.3745. Resistance is at $1.3860, $1.3905 and $1.3940. After J. Yellen's speech, the firming US dollar index tumbled unexpectedly to the 79.75 figure, thus not breaking the important 80.00 level. Negative data on the housing market contributed to the deterioration of the moods as well. U.S. stocks indexes have also slipped into the red zone. S&P500 is losing about 0.20%, DJIA - 0.15%. At the same time, the EUR/USD currency pair has found support in the 1.3790 area and recovered to 1.3835. But here it was met by the strong resistance of the Ichimoku cloud on the hourly timeframe. The pair is returning to the 1.3800 figure at the moment. The UK consumer prices data publication has forced the GBP/USD pair to initially sag to the strong support at 1.6655 and then recover to 1.6750. High market volatility still remains; bears are correcting the course in the 1.6715 area. The USD/CHF pair is still trading near the 0.8800 figure, having tested the 0.8780 support today. Meanwhile, USD/JPY cannot break the 101.90-102.00 resistance. Bears have pressed the market again today and reduced the pair course to the 101.60 support. USD/JPY recovered to 102.26. Yen fell as Japanese stocks rose the most in almost two months. The Bank of Japan’s Governor Haruhiko Kuroda told parliament today the central bank will make the utmost effort to achieve 2 percent inflation. Japan’s Topix stock index rose by 2.3%, the most since Feb. 21. AUD/USD rose to $0.9375 after dipping to $0.9336. Aussie erased an earlier loss after a report showed growth was stronger than forecast in China (7.4% vs. forecast of 7.3%, down from 7.7% in the previous quarter), the South Pacific nation’s biggest trading partner. NZD/USD slumped to $0.8578. The New Zealand’s kiwi is down for the second day after inflation slowed and dairy prices fell. EUR/USD edged up to $1.3825. GBP/USD is little changed in the $1.6825 area after dipping to $1.6656 yesterday. US dollar held a gain against most of its 16 major counterparts as investors sought haven assets amid tension in Ukraine and before Federal Reserve Chair Janet Yellen speaks today. EUR/JPY: 140.00, 141.00, 141.10, 141.15, 141.30, 143.00. The publication of the US past-month industrial production data, which turned out slightly better than forecasted by analysts, has contributed to strengthening of the U.S. dollar index today, after it falling to the 79.70 area. Nevertheless, the dollar is still in the red zone, losing about 0.02%, as of now. In the meantime, stock markets have opened significantly in the black. Thus, DJIA is adding about 0.60%, S&P500 - 0.30%, in expectation of the next speech by FRS Chair J. Yellen. The EUR/USD currency pair has slid to the 1.3820 support area, after testing the 1.3850 mark today, while the GBP/USD pair has been supported by the labor market data. After the announcement that the unemployment rate has reduced from 7.1% to 6.9%, the pair shot to the 1.6820 area. So far, it is consolidating near the 1.6800 figure. Bulls have just tried to go above the 0.8800 figure on the USD/CHF pair, which has been trading in a narrow range all day. USD/JPY has grown to 102.35 but met a strong resistance there, which can force the market to return to the 101.90-102.00 area already in the near future. U.S. dollar index has weakened somewhat today after yesterday's "dovish" comments by J. Yellen who acknowledged the labor market weakness and the low level of inflation in the country. The index was supported, to a certain extent, by today's data on unemployment benefits, the number of which for the past week turned out to be slightly lower than expected - 304 thousand (against the forecasted 315 thousand of applications). At the moment, the American is losing about 0.16%. Major U.S. stock indexes are moving in different directions: S&P500 has gained 0.25% so far, while DJIA is in the red zone, losing about 0.05%. At the same time, the EUR/USD currency pair has slipped to the 1.3830 support, after reaching highs of the day in the 1.3865 area. The GBP/USD pair has returned to the 1.6800 figure where it is consolidating at the moment. USD/CHF is trading within the 0.8780-0.8820 range for the third day in a row and is approaching its upper limit now. In the meantime, USD/JPY seems to have managed to keep above the 102.00 figure and the bulls are willing to resume the recovery. In the absence of major market players (most countries of the world celebrate Good Friday) trading on the currency markets are proceeded very moderately in the lateral direction today. Thus, the currency pair EUR/USD stopped at 1.3820, after a morning rebound from 1.3800 figure. GBP/USD is consolidating in the range of 1.6770-1.6800. USD/CHF has recovered to around 0.8830 after testing support 0.8820, USD/JPY corrected to 102.40. USD/JPY rose to 102.70. Yen fell after a report showed Japan’s trade deficit widened more than forecast last month. EUR/USD remains in the $1.3810/20 area. US dollar is feeling rather well versus yen and euro as the leading US economic indicators that may back speculation the Federal Reserve will remove stimulus this year. Tense situation in Ukraine keeps affecting the market. In Europe banks are closed due to the Easter holidays. GBP/USD is in the $1.6800 zone. Aussie and kiwi keep on correcting lower after peaking on April 10. AUD/USD extends the bearish retracement, consolidating in the $0.9340/20 range. NZD/USD swings in the $0.8600/8560 range. The $0.8560 support remains strong for now. The Reserve Bank of New Zealand will hold a policy meeting on Thursday – interest rate is expected to be hiked by 0.25% to 3.00%. Here are the essentials of the latest Commitments of Traders (COT) report, released on April 18 by the Commodity Futures Trading Commission (CFTC) for a week ended on April 15. According to the report, net long USD positions contracted versus the other major currencies. Euro positions rose after three straight weeks of declines. British pound net bullish positions gained for a 5th consecutive week and rose to their highest level since February 15 2011. Japanese yen short positions contracted. Australian dollar contracts improved for a sixth consecutive week. Weekly. EUR/USD is forming the wave (Y) of [D] of the convergent horizontal triangle. Daily. The wave mentioned above is taking form of a double Zigzag. At present, euro’s forming the final zigzag [A] - [B] - [C]. H4. In the near term the correctional wave (4) will be over.Tthen the growth will continue within the impulse (5) as it’s shown at the picture. When the wave [C] of Y is complete, we’ll expect the market would to reverse. Weekly. During the last 8 months the market has been growing within an ascending impulse [C] of B. Consider the layout of the bullish trend. Daily. The chart shows the layout of the rising impulse. The pair’s currently forming correctional wave (IV). H4. GBP/USD is forming the wave (IV) which takes the form of a Zigzag. Once the upward impulse (5) of [C]is complete, the pair will start declining within the impulse C. The estimated trajectory is shown at the picture. Daily. USD/JPY is forming the long-term corrective wave IV. When this wave is complete, we’ll see a new uptrend, which will be the wave V.
H12. The more detailed markup tells us that the wave IV is complete. This complex wave took the form of a Double Three. H4. The wave [y] took the form of a plane wave. In the last section we see the beginning of growth in the wave V. It’s too early to make the layout of this wave, but we can say that this week we expect the pair to rise. Weekly. The global emerging structure is a Zigzag. The correctional wave [b] which is a part of it is complete. In the coming months we expect the pair to rise. Daily. Downward impulse is complete . In last section we saw growth in the first wave of the new uptrend. H4. The figure shows a detail layout upside impulse, the fourth wave of which took the form of an extended oblique triangle. Next week we expect correctional decline in the wave (2). EUR/USD spent the past week in the sideways $1.3790/3865 channel. The market demand for the euro remains subdued – the currency holds below the April 11 high at $1.3905. This week we expect the greenback to take over in this battle. The recent strong figures from the US and the persisting expectations of the ECB policy easing are limiting EUR/USD upside. Technically, the 2008-2014 resistance and the top of the monthly Ichimoku still remain a strong barrier for the euro bulls (around $1.3820 as of writing). The next medium-term resistance lies at $1.3965, $1.4000 and $1.4240. However, the euro buyers won’t give up so easily. The passive ECB remains a supportive factor for now. Evidently, any regulator’s "dovish" words will trigger a mass EUR/USD selloff. Watch the ECB Draghi speaking on Thursday. Technical support for the pair lies at $1.3670, $1.3600 and $1.3475. In condition of the subdued Easter-related activity we recommend staying out of the market for now. I would recommend selling the euro on a break of the $1.3800/3780 area. A bunch of interesting statistics will be released on Wednesday (EU PMIs, US new home sales) and Thursday (German business confidence, Draghi speech, US labor data). GBP/USD keeps trading in the $1.6800 area. On Thursday the pair touched the highest level since 2009 on the dovish comments from the Fed’s Chairwoman Janet Yellen, while pound was boosted by the UK’s strong jobs and wages data released on Wednesday. It seems that Yellen has decided to calm investors who were worried of sooner monetary tightening as US economy is gaining momentum. So far, the economic data in the US is strong, but not too strong, so the Fed still is able to make the market calm down. In Britain the unemployment rate fell from 7.2% to 6.9%, while average earnings index rose by 1.7% vs. 1.5% expected. This strengthened the expectations for the Bank of England’s rate hike in the first quarter of 2015. Although British central bank may not be entirely happy with such an advance in GBP, it’s not likely to somehow make the national currency go lower. On Wednesday the BoE will publish the MPC meeting minutes, so the regulator’s attitude might become a bit clearer. As the UK economy looks really good, GBP/USD can test even higher levels – $1.6900 and $1.7040 don’t look unrealistic. To break above we need a move above $1.6877 (Nov. 2009 high). Still, a move to 2009 highs will likely be the final increase. As for the near term there’s was a small shooting star candle on Thursday. Support lies at $1.6750, $1.6685 and $1.6600 ahead of $1.6475. The pair may be trading mainly in the $1.6800/6700 in the near term. Most Asian stocks rose as US equities capped their longest stretch of gains since October and the yen extended losses, boosting the outlook for Japanese exporters. Markets in Australia, New Zealand and Hong Kong resume trading after holidays, ahead of a report on Chinese manufacturing due tomorrow. MSCI Asia Pacific Index added 0.1%. USD/JPY is trading in the 102.55/70 area. The greenback remains supported before data forecast to show continuing improvement in the US economy. Today America will release existing home sales data (14:00 GMT). Both AUD and NZD gained a little ground, with AUD/USD rising by 40 pips to $0.9355 and NZD/USD touching $0.8590. Looking ahead, Australian inflation numbers, China’s manufacturing PMI and the RBNZ policy meeting over the next two days will attract market attention. Gold is trading under a slight bearish pressure around $1287.5. EUR/USD is right under $1.3800, while GBP/USD is just below $1.6800. The Reserve Bank of New Zealand will conduct a meeting tomorrow evening (21:00 GMT). According to the forecasts, RBNZ will raise its benchmark interest rate by 25 bps to 3.0% within its current tightening cycle – all 17 economists polled by Reuters expect this outcome. As RBS puts it, it’s hard to sell the currency whose central bank is raising rates when so many others are still glued close to the zero bound and when the Fed makes dovish comments. Still, the specialists underline that New Zealand’s dollar is the world’s most expensive currency in REER terms (real effective exchange rate). In their view, the rallies of NZD/USD to the $0.8700/9000 area should be used for opening short positions on the pair. NZD/USD is currently trading in the $0.8555/8600 area. There actually are reasons for the central bank not to hurry with a rate hike. These reasons include lower inflation which fell to 1.5% in the first 3 months of the year from 1.6% in Q4 and falling dairy prices which lowers New Zealand’s exports revenue. Even if there’s a hike, traders will be examining the accompanying statement as it may contain comments about foreign exchange rates and general economic outlook and searching for some softer tone coming into the central bank’s next meeting in June. ANZ says that the rate hike expectations are already fully priced in the NZD. This reduces NZD’s chances to jump on the rate hike and increases its potential slide if the RBNZ disappoints. Before the RBNZ decision pay attention to Australian inflation data (01:30 GMT) and China’s HSBC flash manufacturing PMI (01:45 GMT) earlier on Wednesday. USD/CHF moves up for a second week, approaching the 2013-2014 downward-sloped trend line (currently around $0.8900). US dollar gained some ground on the back of rather positive statistics. However, the upside will likely be limited until the geopolitical tensions in Ukraine end. Technically, USD/CHF is trading in the “falling wedge” pattern since April 2013. Break above the 0.8860 resistance will open the way towards the wedge resistance around 0.8900, but this level is expected to cap for now. If the buying pressure isn’t strong enough, the pair will stay within the wedge and slide to 0.8600 in a few weeks. However, a drop below 0.8600 looks unrealistic. Strong currency has already hurt the Swiss economy in Q1 and the government won’t let the things worsen. Last month the IMF advised the Swiss National Bank to introduce negative interest rates on the banks’ excess reserves in case of renewed strong pressures on the franc. NZD/USD: $0.8600, $0.8675, $0.8700 (large). The Australian government has recently expressed its concern with regards to the RBA recent shift to 'neutral' in policy stance, Financial Review website says. As AFR notes: "The Reserve Bank of Australia’s move to a “neutral bias” on monetary policy has angered the Abbott government, which believes any upward pressure on the dollar will make it harder to manage the economy." Government believes that the current neutral bias by the RBA was the main factor leading to the currency appreciation. Former Ministry of Finance official Eisuke Sakakibara, known as “Mr. Yen” for his efforts to influence exchange rates in the late 1990s, said that Japanese yen will weaken as the Fed’s tightening its bond-buying program. “It is more likely that the dollar will rise toward 110 yen than for it to break below 100,” said Sakakibara. According to the median estimate of more than 50 analysts in a Bloomberg poll, USD/JPY will rise to 109 by the year-end. Norio Sasaki, a member of Japan’s government panel subcommittee on corporate tax reform, said that Japan could cut its corporate tax rate as early as next fiscal year by 2-3%. Japan’s effective tax rate of about 36% is the second-highest in the G7 after the US and compares with levies of about 24% in South Korea and 23% in the UK. The nation’s Prime Minister Abe pledged to pursue corporate tax reforms earlier this year, part of his Abenomics drive to revive the national economy. In June Abe will outline further measures to improve business conditions in Japan. Note that the tax cut will be accompanied by a rise in revenue from other sources to avoid worsening the government’s fiscal position which is already in a very bad shape. According to the respected China economist Yu Yongding, despite a further slowdown in Q1 (GDP +7.4%), China will not face a collapse as some pessimistic observers warn of. In his view, complexity and distinctiveness of China's economy meant gloomy predictions were pointless, and that they have repeatedly emerged in the past 30 years but never came true. Yu dismissed concerns over the country's high leverage ratio and property bubble. China's high leverage ratio, which some believe will trigger a crisis or "hard landing", should be interpreted with other detailed factors taken into account. China's high saving rate is positive factor for the economy. "The higher the saving rate, the less likely it is that a high debt to GDP ratio will trigger a financial crisis", Yu says. Asian stocks erased gains after Chinese manufacturing data signaled persisting weakness in the world’s second-largest economy and Australia’s inflation rose less than expected. USD/JPY is on the downside in the 102.70/50 area. The greenback remains near a 2-week high against the yen before US reports on manufacturing and new home sales that may add to signs the economy is improving. AUD/USD fell to $0.9280. Australian CPI came out lower than expected (0.6% vs. 0.8% expected). In addition, a private report signaled that China’s manufacturing contracted for a fourth straight month – HSBC Flash Manufacturing PMI came at 48.3 which is once again below the threshold 50.0 level (forecast: 48.4; previous: 48.0). NZD/USD tested $0.8620, but then returned a bit below $0.8600. EUR/USD rose to $1.3820 approaching yesterday’s high. GBP/USD is trading in the $1.6820/35 area. China economy remains in the centre of market attention. Today’s data showed that China HSBC manufacturing PMI improved a little in April, but remains in the contractive zone since the beginning of the year (48.3 vs. 48.0 in March and forecasted 48.4). 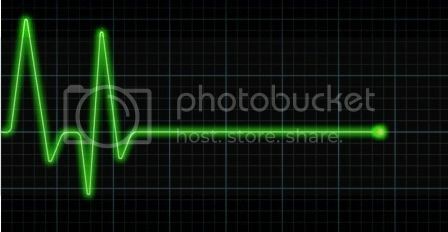 A reading below 50 signals contraction, while a figure above 50 suggests growth. The report followed data last week showing China’s expansion moderated to the slowest pace in 6 quarters. Economic growth slowed to 7.4% y/y in Q1, from 7.7% in the Q4 2013. Prospects of China economic stimulus remain a topic of interest for the market. Yesterday China's central bank announced a so-called “mini stimulus”, cutting the reserve requirement ratio (RRR) for rural banks. The government negates the need for a more foreceful stimulus, but many economists believe it is a matter of time before China takes it to support the slowing economy. Nomura analysts reiterate their forecast for a broader reserve-ratio cut for banks in May or June. “The property sector is slowing down very fast and that's the reason why we're very worried about the Q2 GDP. We think it's going to slow down," they say. Additional China stimulus could become a supportive factor for the commodities and the commodity currencies. EUR/USD strengthened by more than 50 pips to $1.3850, supported by the upbeat preliminary euro zone PMI figures for April. With the exception of the French results, the German and euro zone manufacturing and services PMI exceeded forecasts (see the table). Composite euro zone business activity reached a 3-year peak (54.0 vs. 53.1). “Today’s figure buys the ECB a bit more time. With the recovery still on track there doesn’t seem to be an urgent need for strong action, though deflationary pressures still warrant attention. People expecting an imminent large-scale asset purchase program on the back of current economic figures are likely to be disappointed”, ING economists said. Asian stocks fell after an unexpected drop in US home sales signaled a housing recover in the world’s largest economy is running out of steam. MSCI Asia Pacific Index lost 0.3%. Nikkei 225 is down by 0.95%. USD/JPY declined to 102.25, but is above yesterday’s low at 102.16. Yen held its first gain in nine days versus the dollar on speculation data tomorrow will show Tokyo inflation quickened the most in more than two decades, dimming prospects the Bank of Japan will expand stimulus. New Zealand dollar was the mover, jumping on the RBNZ meeting outcome. As it was widely expected, RBNZ announced a rate hike by 0.25% to 3.00%. Regulator showed that more hikes are to come, but the timing remains uncertain. NZD/USD rose by more than 50 pips, touching $0.8635. AUD/USD consolidates in the $0.9285/9300 range. Gold slowed the downside over the past 2 days, recovering some ground to $1285.5. EUR/USD rose to $1.3825, but is below yesterday’s peak at $1.3854. Euro remained higher before a report today forecast to show a gauge of German business conditions climbed to a 2-year high. GBP/USD edged up a bit to $1.6790. EUR/USD fell by more than 40 pips to $1.3790 as the ECB President Mario Draghi flagged the bank could make asset purchases to fight the threat of deflation. Draghi added that negative deposit rates remain an option for the government. The ECB head admitted that a strong euro reflects return of confidence in euro zone, but a higher euro could derail euro zone recovery. Orders for durable goods in the U.S. rose by 2.6% last month instead of the forecast of 2.0%. It caused the dollar index to jump to the highest mark in the last few days 80.05. However, the subsequent unemployment data (number of applications for unemployment benefits last week rose to 329 thousand, instead of the expected 310 thousand) had a negative impact on the market: the dollar index fell to around 79.90 and is currently losing about 0.10%. Stock markets also opened with a reduction. S&P500 is losing about 0.15% and the DJIA - about 0.05%. In currency markets volatility increased during the occurrence of specified data. Thus, the pair EUR/USD had fallen to around 1.3790 mark from 1.3830 after another speech of Draghi, who reiterated the reluctance to see an expensive euro, but at the moment it newly recovered to the area of 1.3815. Currency pair GBP/USD tested the 1.6770 support and rose to the 1.6800 figure. USD/CHF pair fell to 0.8820 support after forming the maximum in the area of 0.8855 today. The pair USD/JPY is testing yesterday support 102.10-102.15 again, after the jump to 102.60. USD/JPY rose to 102.50, but then returned by 20 pips lower. Japanese yen remained near the strongest level in a week against the dollar as tensions between Russia and Ukraine increased demand for safety. US Secretary of State John Kerry warned that Russia was running out of time to comply with an accord aimed at de-escalating the situation in its neighbor. Tokyo core inflation came at 2.7% the most in more than two decades, though was slightly lower than the forecast of 2.8%. Asian stocks fell, MSCI Asia Pacific Index dropped by 0.4%. Commodity currencies have regained some ground in Asia. It was a holiday in New Zealand and Australia, so there is basically no news from the region. AUD/USD found support at $0.9250 and recovered to $0.9280. Aussie is consolidating at the lower border of the April bearish channel. NZD/USD met buyers at $0.8545 and rebounded to $0.8570. Gold consolidates at $1293,3. EUR/USD is trading in the $1.3830 area. GBP/USD is just above $1.6800.